While I'm talking about airbrushes, I suppose I should mention this in passing. It's the Badger 250, and it's really about as basic as you can get. It's not really an airbrush, but a small spray-gun. I very seldom use it; in fact, I can't remember the last time I did. I have much better tools for the job. I should note that Badger don't make any pretence that the 250 is anything more than what it is, and what it is is a cheap tool for spraying paint without any particular precision. Paint flow is governed by turning the nozzle rising up from the paint reservoir. In theory, you can moderate the amount of paint being squirted out, but in practice I've found it to be pretty much either on or off. Air flow is set at the compressor. You can pick one up for about $25, but even if you don't want to go the whole hog into airbrushing, I'd really recommend spending just a little bit more and getting a decent single-action airbrush — it will be a lot more useful to you in the long run, and it will only set you back another twenty bucks or so. 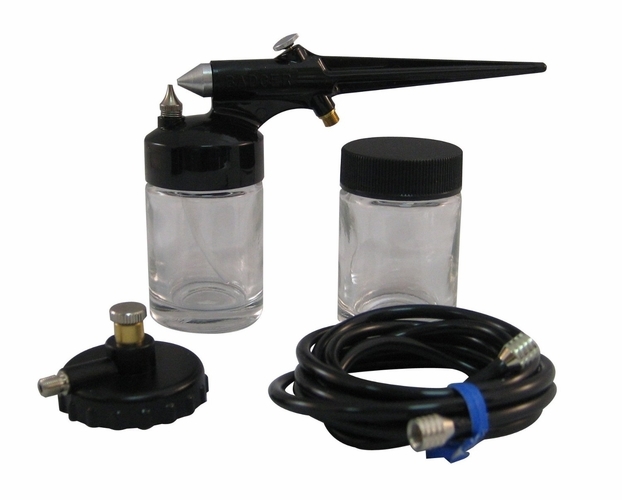 I just bought another new airbrush, as usual from Chicago Airbrush Supply, who have yet to fail me. They rock. 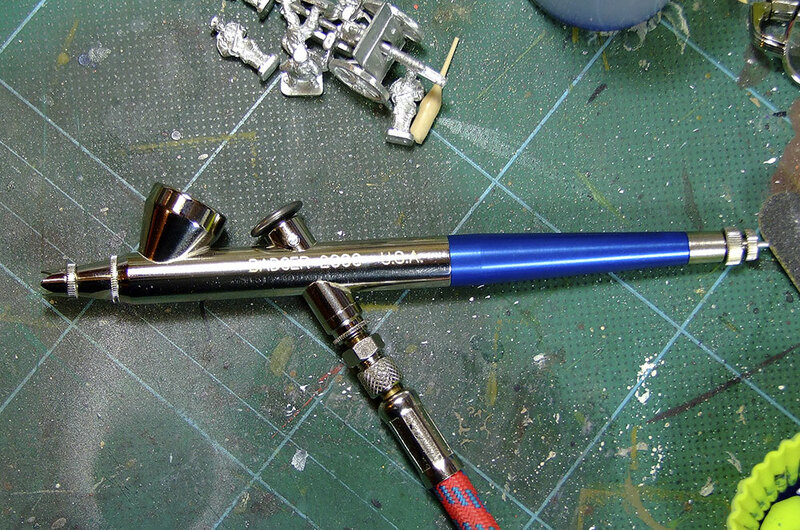 This time it's a Badger 200GF, a single-action gravity-feed internal-mix airbrush. I bought it with the Fine (F) head/needle, which will do lines down to less than a mllimetre thick. Paint flow is adjusted via a knurled knob on the end of the brush, while air flow is controlled directly from the compressor's regulator. Thus far, I've only done a quick test-sheet in watercolour on 300gsm laid paper (see below), but already I can tell that this airbrush and I are going to get along swimmingly. It's my favourite brush of all that I've tried so far, and even though it's a humble single-action, I doubt that that will often be any kind of issue. Even at very low air pressure (I went as low as 6psi for my test-sheet) its spray is fine and even, and its lines are pretty even and regular. The only serious problem I've noted so far is that my hands are revoltingly unsteady, so straight lines are more a matter of fluke than intention. I can't reasonably blame that on the brush though. It cost me about $45 from Chicago Airbrush Supply, which I consider to be a very good price indeed. I bought these 15mm WW1 BEF figures from Peter Pig some considerable time ago, and they've been sitting around half-painted for about that long. I'm not at all fond of production-line painting figures, so that's a situation that happens a lot. I have a platoon of 15mm WW2 German Grenadiers in the same plight; I really should do something about finishing them off as well. I'm pretty pleased with what I've seen of Peter Pig's figures so far. I thought at first they were a bit blobby, but on closer acquaintance I find they have a decent level of detail, they're not too fragile, and they paint up nicely. I wouldn't mind a little bit more variation of pose for troops like these, who spend most of their time in skirmish order, but I can live with it. At least they're not all identical. These figures aren't actually intended for WW1 gaming; there aren't nearly enough of them for that. They'll be used for skirmish gaming: pre-war colonial fights, maybe a spot of repression in Ireland (in fact they were originally going to be painted as Black & Tans before I decided to keep them a bit more generic), and possibly a bit of inter-war VBCW stuff. 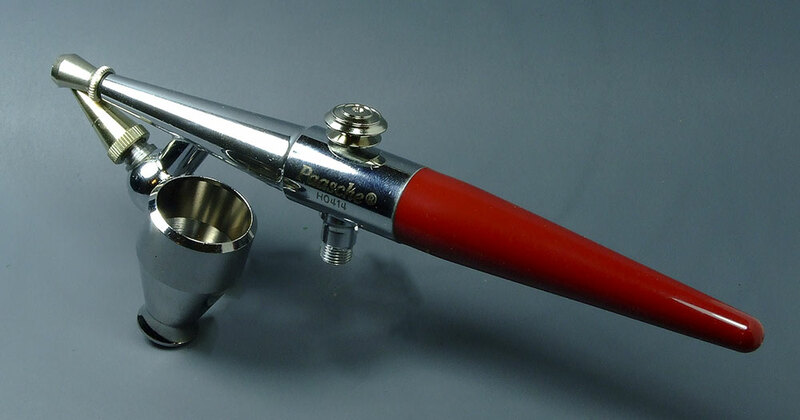 This is a relatively cheap, well-engineered, basic airbrush. It cost me about forty bucks from Chicago Airbrush Supplies. It's fitted with the .55mm head and needle, and is capable of painting a pretty fine line. However, like most (but not all) single-action brushes, it's an external-mix design. The paint is drawn up through the conical assembly you can see hanging under the front of the brush by suction from a stream of air rushing past its nozzle. It's a simple and well-tested spraying method, but it does result in a grainier spray than an internal-mix brush in which the paint and air are both squirted out through the same nozzle. You can suppress the graininess of the spray to a degree by increasing the air pressure, but of course this will make fine-line work difficult, if not impossible. 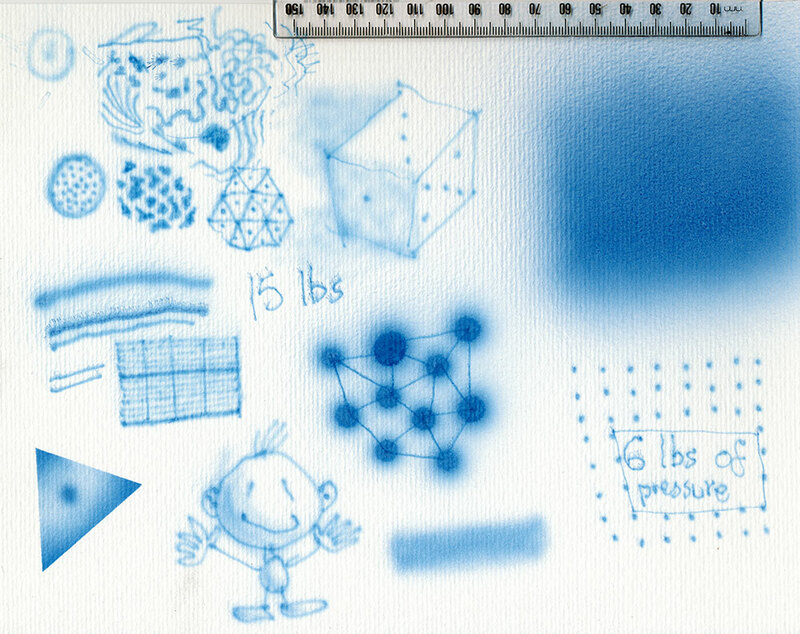 If you want a grainier, spatter spray pattern, you can achieve that by dropping the pressure right down. A benefit of the external-mix model is that it generally allows one to spray paint of a somewhat heavier viscosity than an internal-mix brush will cope with. The paint flow is controlled by turning the conical knob clockwise (to increase the flow) or anti-clockwise (to decrease it). Air flow is either on or off; any adjustment has to be done via a regulator at the compressor. The small metal cup shown in these photos is easy to get on and off the brush, but one must be aware that because of the angle of the pipe that goes into the brush, if you fill it more than about half way when it's not attached to the brush it will dribble paint all over the place. There are other paint bottles available, up to 8oz in size, which is quite a lot of paint for modelling purposes. This is a good, well-engineered device for someone who is beginning airbrushing and wants to ease into it before tackling a double-action brush. I'll be using it primarily as a spray gun (with bigger paint bottles) rather than as an airbrush, due to its ability to get a whole lot of paint out on to a surface — it will be a lot more useful for terrain-painting than either my Badger 150 or Paasche Talon. 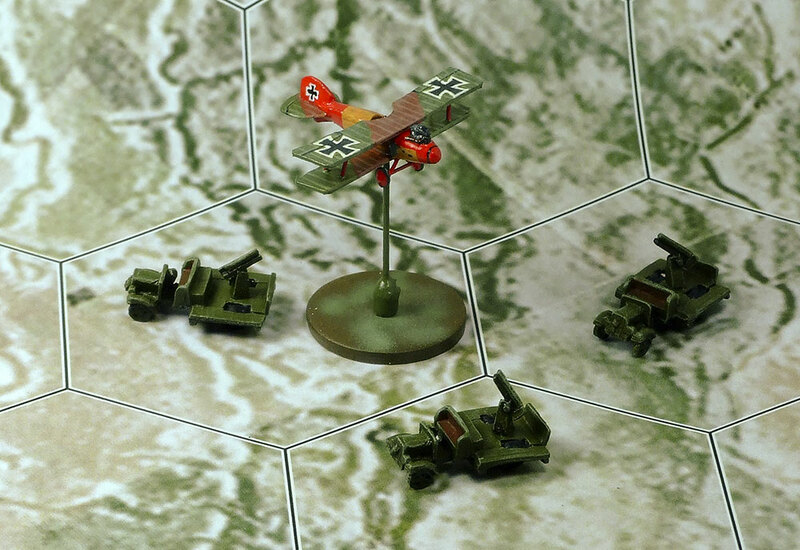 I bought some Heroics & Ros WW1 AA guns to use as markers in my Canvas Eagles games. These ones are British lorry-borne 13pdrs, surrounding an Albatros D-II; I have twelve of them. I have a dozen Krupp 7.7cm guns on Daimlers as well, for the dastardly Boche to use. Another refreshing glass of Kool-Aid? Don't mind if I do. I've been playing D&D, in its various incarnations, for quite some time now. I've played with a lot of other roleplaying systems as well, but D&D has always been there, sitting in the background — when I was using the Hero System, I was pretty much using it to play D&D, but with even more book-keeping. The last "official" version I played to any great extent was the 3rd edition. It had its merits, but its byzantine character creation rules (feat chains! Aaaaarrrgh! Skill points! Aaaaarrrgh! ), along with some clumsy peculiarities of its combat/action resolution rules became too onerous and frustrating, and I went back to Hero (5th Edition, that time). I was profoundly under-impressed with D&D's 4th edition. It seemed to me to be nothing much more than a very much more complex version of the boardgame Descent, only without the board. Though it appears you could buy boards, so there's that. I tired of the Hero System's relentless accounting, and thanks to the advent of the OSR, went to a much more free-form D&D-ish game through Swords & Wizardry and Labyrinth Lord. I had no intention of bothering with the 5th Edition (D&D Next, as they've been calling it), but I've changed my mind about that. WotC has indicated that they'll be releasing Basic D&D as a free pdf, and free is a price-point at which I'm prepared to investigate the possiblitites of the new, improved Kool-Aid. I didn't engage in the playtesting process for 5th Edition, so I don't know precisely how it works, but noises have been made about it allowing a much more "old-school" style of play... just what that means to Mike Mearls and co., I don't know, but it piques my interest enough that, come July (that's only a month away now! ), I'll fire up the downloadin' machine and take a look. Who knows, maybe this time it will be PERFECT. 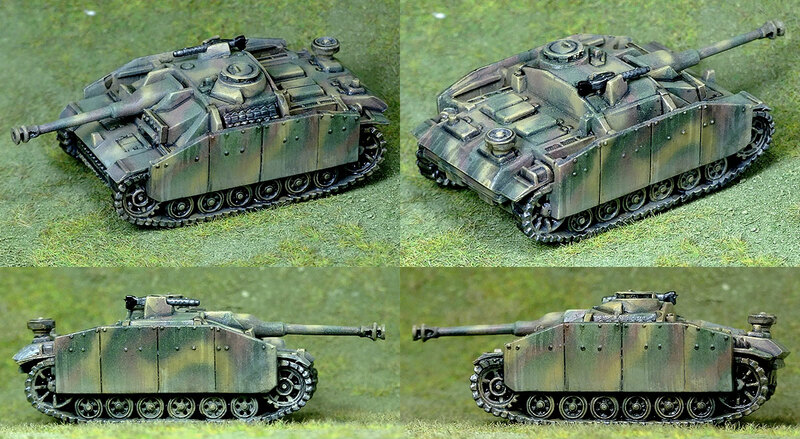 Here's another 15mm resin and white metal model from Battlefront, a French Panhard-Schneider-Kegresse half-track. It was designed in the 1930s and saw service in the Battle of France. I've painted it in one of the four-colour disruptive patterns the French developed during WW1. They were still around by WW2, though three or two colour patterns were more common by then. I've no idea whether these half-tracks were ever painted in the four-colour scheme, but I like it, so this one has been. 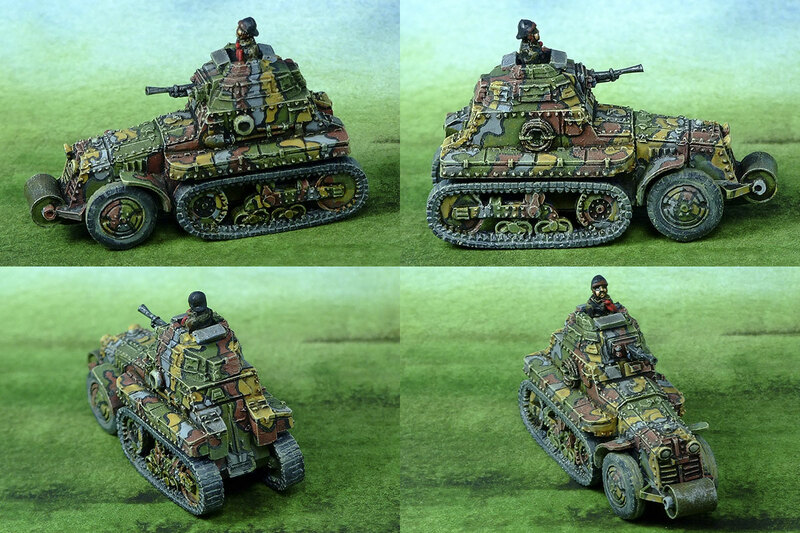 This particular vehicle looks to me as though it belongs in a Warty-Kay Ork army rather than a real army. I know the rivets wouldn't be as prominent on an actual vehicle, but even so the proportions of the thing are just kind of... goofy. 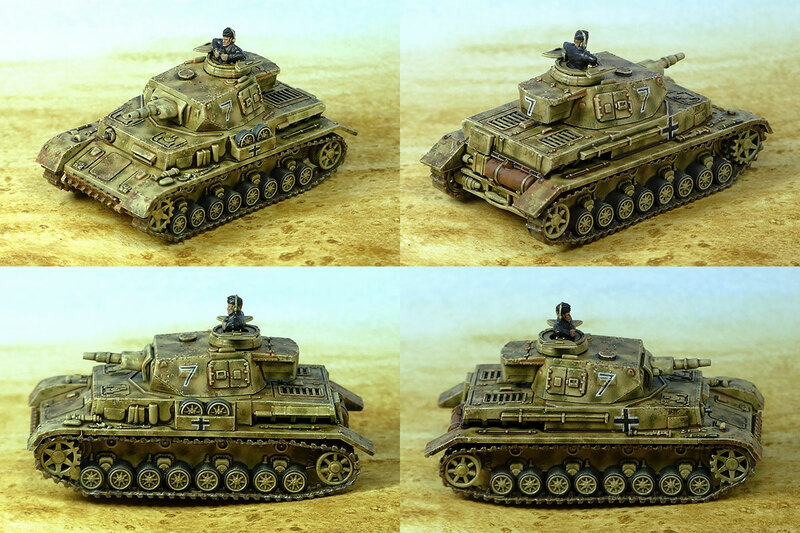 Another one of PSC's 15mm plastic Panzer IV models, this time the f1 variant painted in a more or less tropical colour scheme. I got this in one of Battlefront's starter sets — I think it was titled "Open Fire" — some time ago. It was in the clearance bin at the local comics-and-games shop, and I thought that it would be a cheap way of getting a few more vehicles to add to my collection. The box came with two of these StuG III and three Shermans. The StuGs are passable I suppose, but the Shermans are among the worst plastic kits I've ever encountered — the scale and silhouette is fine, but the construction design is execrable, with ill-fitting pieces and huge gaps in screamingly obvious areas, requiring a great deal of filling and filing to get a half-way acceptable end product. Anyway, I finally got around to painting this one. It'll do, I suppose, but it's not a great advertisement for Battlefront's injection-moulded plastic kits, and I'd be much more inclined to go with another manufacturer like PSC.